This is the second month of my OwlCrate subscription, and it really blew me away with all the goodies inside. OwlCrate hooked me with ‘Find Me in the Forest’ and reeled me in with ‘Castles, Courts & Kingdoms.’ Let’s dig into this review of OwlCrate’s November box: ‘Castles, Courts & Kingdoms’! Overview: OwlCrate is a monthly subscription box that contains a newly published hardcover Young Adult book with a special cover, 3-5 other items, as well as exclusive goodies from publishers and authors. Each box also has a unique theme every month! Review: I was so excited for this theme! I love medieval settings with strong women and a dash of romance. I couldn’t wait either to see what what Harry Potter item would be included this time! The box came two days after I got my tracking number, and I waited a few days to open it due to the holiday craziness. The wait was so worth it though! The small postcard on top goes into detail about each item inside the box with a handy spoilers tag. I always set this aside first so I can dig in without spoiling any of the items. There is a booklet with an author interview, word search, suggested reads if you liked the book, an interview with Fizzy Fairy Apothecary, photo challenge, and next month’s theme! There is also a matching button to go with the booklet’s cover art. The book in this month’s box was The Glass Spare by Lauren Destafano. After opening the book, I found an autographed bookplate and a note from the author! 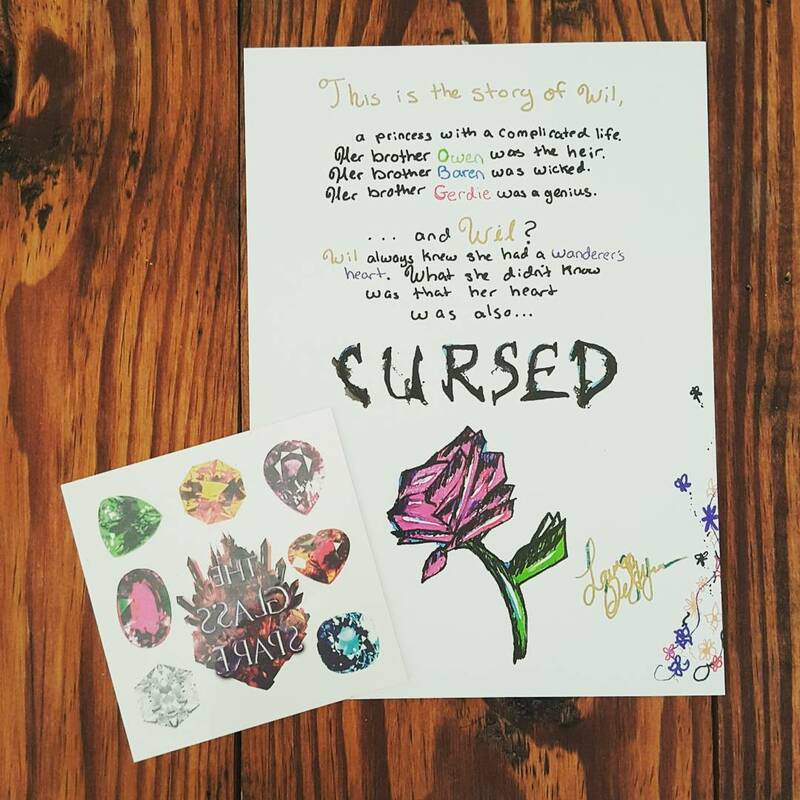 Here’s the note from the author as well as some colorful temporary gem tattoos! This wooden brooch with magnet back from Juniper and Ivy Designs is based on the Grishaverse was specially made for OwlCrate subscribers! There’s 3 brooches total; which one did you get? My favorite item in the box was this Expecto Patronum beanie from OwlCrate! I wear it every day. I also lovelovelove my lip balm in blackberry mint from Geek Fire Labs. Last but certainly not least is this adorable Elven bread soap from Lord of the Rings by Fizzy Fairy Apothecary! You may have seen it on my instagram feed last night as the “soap which may not be used… only looked at and sniffed!” The smell is A-MA-ZING! Bottom Line: Love Young Adult reads? 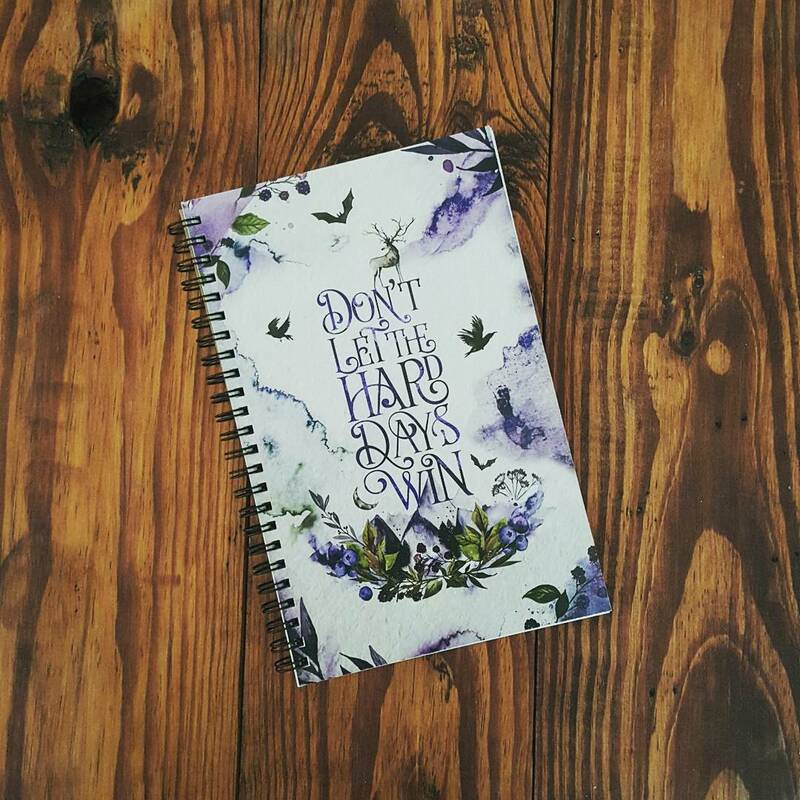 Love bookish , handmade items from your favorite fandoms? 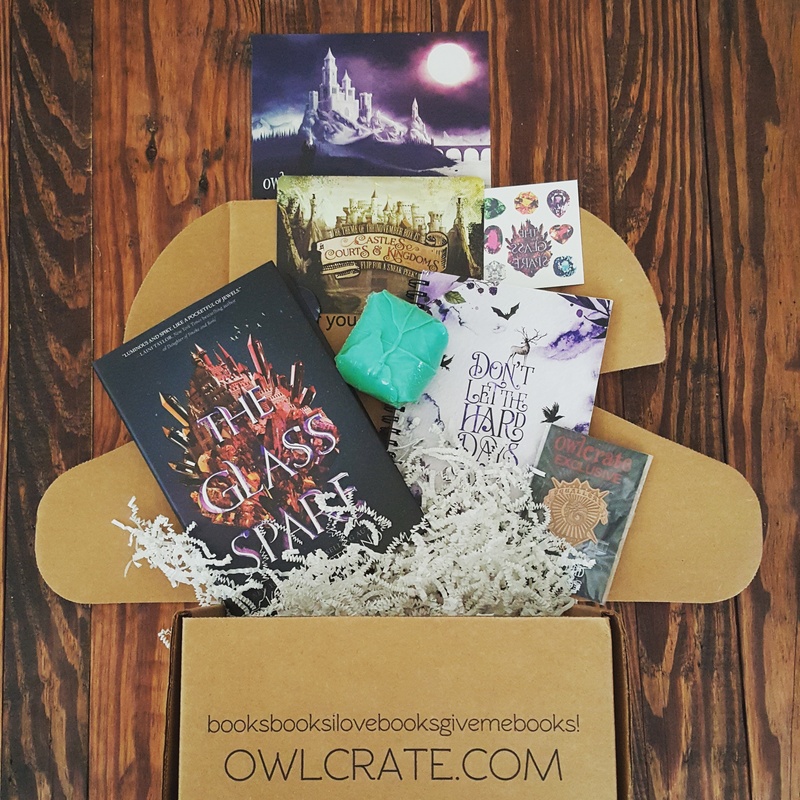 You’ll love OwlCrate! Would you like to see a video of next month’s OwlCrate unboxing? Leave me a comment if you prefer the blog style review or if you wanna see a Youtube unboxing! Or both?! Welcome to the first installment of Link Loves. This post is all about my favorite links of the week! It can include bloggers, articles, news, clothing, accessories, and other cool links I’m enjoying. As someone on her own weight loss journey, I’ve read hundreds of articles on what to eat, what not to eat, diets after diets, and this one is the best yet. Read it; you’ll be glad you did. I lovelovelove enamel pins. With my first Owl Crate box a success, and a second one on the way, this pin speaks to me… Get it here. Say hello to my new favorite designer! From Harry Potter to Game of Thrones, she’s stolen my geeky heart. Check out her page here for more geeky designs and clothing! I want to steal every single one of Margot’s outfits (and she makes it so easy for you to do it)! One of my favorite bloggers, IG accounts, and fashion icons: meet Margot Meanie. You should give her accounts a follow while you’re there. I found this awesome store on Pinterest then got to see their brilliant items in person at a vintage market right here in St. Louis, MO! Frank Regards recently opened up a shop in St. Charles, MO and it. Is. Bomb. Grab the tote here and browse for even more awesome goodies. This collection is currently $70 and under! Grab it while it’s discounted. That coat has my name AAALLLLLL over it. And the skirt has POCKETS! 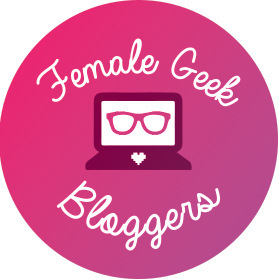 If you’re participating in The Nerdy Girlie’s 5 Fandom Friday, you may have noticed a few of us have made some DLC’s to complement the already lengthy blog prompt list courtesy of The Nerdy Girlie and Super Space Chick. You can check out my first DLC for 5 Fandom Friday: the GG Pack (the Geeky Gal Pack) which features this blog prompt! Add some gold to your geek chic desk decor with this snitch clock from PBTeen for $49.